Through the end of high school and all through college and up until recently this little Swingline stapler has lived in my backpack. It has been pretty useful to me in many instances, stapling academic deliverables last minute or tacking things onto bulletin boards and other tasks. Here is the magazine, you can see the small nubbin and catch that hold the stapler closed (at least for a few short seconds). I found a little stapler for $7 at a store where I have some store credit. It is a Swingline Tot 50 Deluxe, and when I looked it up on google I was very surprised to learn that my little blue Swingline is also a Tot, but the modern version. The old Tot has the older style sliding magazine, but it never springs open on accident while in my backpack! The one thing which makes the new superior to the old is that you can just buy normal staples for it. The older Tot has much harder to find mini staples. The older Tot came with a box with some staples still, and I found a box for $1 at an antique store just a few days later. I don't staple a lot so I think I am set for quite some time now. 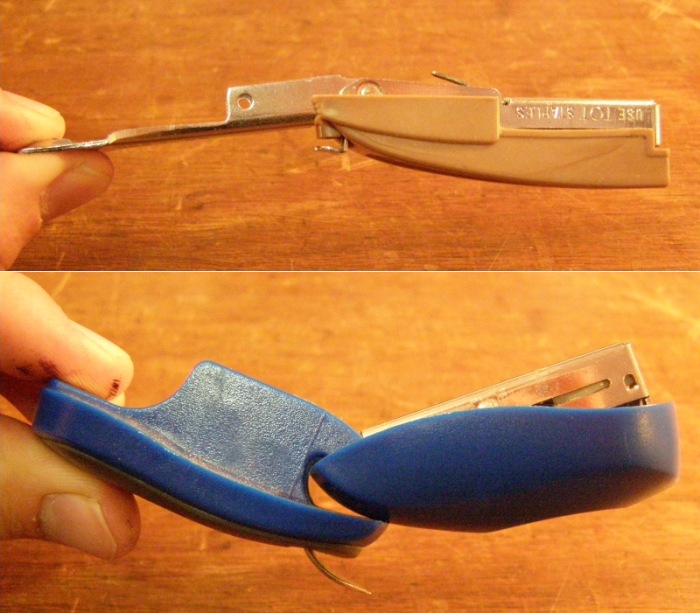 These staplers offer similar performance, this is a sheet of note paper folded so it is eight layers thick. A significant flaw of the newer blue one is that it only opens perhaps 150 degrees or so, which has made tacking more difficult on several occasions. The older model opens in excess of 180 degrees, and is all around just much better. I will be giving the blue one away to the next person I meet who needs to borrow a stapler. I collect typewriters, and I suppose I dabble in staplers. In back is a big heavy duty Swingline extended reach stapler. It can easily punch through an entire legal pad, cardboard backing and all. It is overkill for a few pages, and the staple comes up through the front if there are too few. In the middle row are two Arrows I keep on my desk: one for permanent stapling and one for temporary (why bother with the anvil when you can justify two staplers?!?) In the front is my "new" backpack stapler and the old one which is inferior. I love staplers. I have a regular Tot 50, in red. I also used to have one of those modern ones, mine was purple. The mini staples are still available online. Aren't we a curious bunch - so easily pleased!! Anyway, thanks Mark for keeping us entertained, and to you and all your followers -- Happy Holidays, and Happy New Year!